Happy New Year to all my readers! Whether you want to call it a New Year’s Resolution or not, we would probably all agree that the beginning of a new year often inspires us to think about new paths and goals – many of which focus on a simple desire to be more healthy and fit. Rather than beating yourself up when you fail to meet unrealistic goals, how about we focus on taking a few baby steps in 2018? My ‘Do One Thing ’philosophy is exactly that – small, yet significant steps that will put you firmly on the right track towards improved health. In my experience, once we start to enjoy those rewards we find ourselves craving more! Introduce smoothies to your day – ok, so with this one you might be thinking…“Phil this is hardly a groundbreaking suggestion, I mean smoothies are everywhere nowadays!” – and you’d be right! However, when it comes to a raw food lifestyle, making your own smoothies at home is an undeniably brilliant way of increasing your intake of raw fruits and vegetables. Remember, they are also a fantastic way to pack in those all-important sources of protein too, such as nuts, seeds, or PuraDyme’s Raw Liyf Protein powder, and the health-giving fats found in foods such as avocado and coconut oil. Now allow me to be a little bossy here, I must mention the importance of investing in a powerful blender/smoothie maker – one that is even capable of breaking down nuts, seeds and frozen berries – I use a Blendtec to do this. The blending action of a powerful blender helps to ensure that smoothies are palatable, and the ingredients are thoroughly mixed into smaller food particles which are more readily broken down and absorbed by the body. In other words, much of the initial chewing has already been done for you – you lucky thing! Saying that, even in the case of smoothies, it is still important to chew. Eat more raw foods alongside your cooked meals – let’s say you’ve cooked yourself a lovely vegetable chilli or tasty bolognese; rather than serving it with a heavy carbohydrate such as rice or pasta, why not serve it on a bed of spiralized raw courgette or even carrot? Spiralizers are easy to come by now and the good news is that they are unlikely to break the bank! 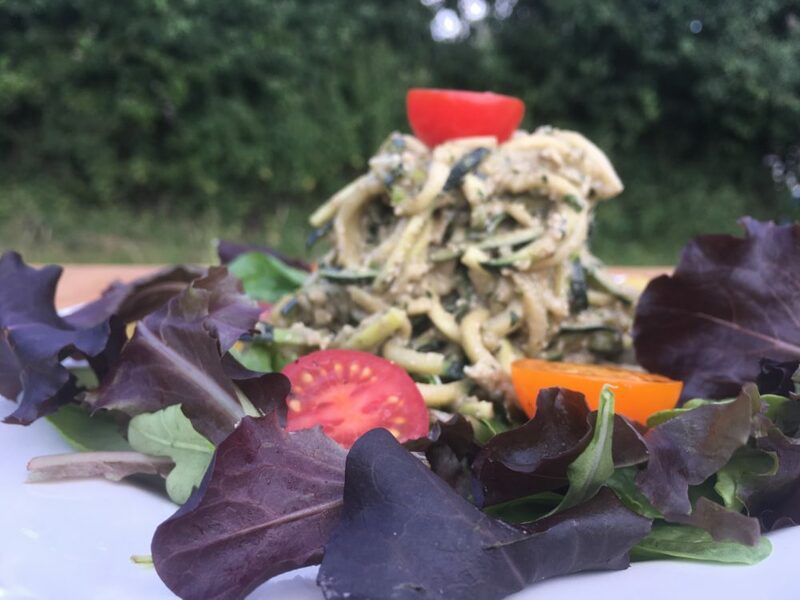 Opting for courgetti rather than spaghetti, means that you’ll be treating your body to a lighter meal that includes an extra nutritional boost from the raw vegetables. Make a raw pudding – most people enjoy a good pudding right? Check out my Chia Pudding Recipe. It’s dairy-free, gluten-free and free from refined sugar – it tastes delicious and is so simple to make. I love using chia seeds, as they are renown for being a great plant-based source of the vitally important omega-3 fatty acids. 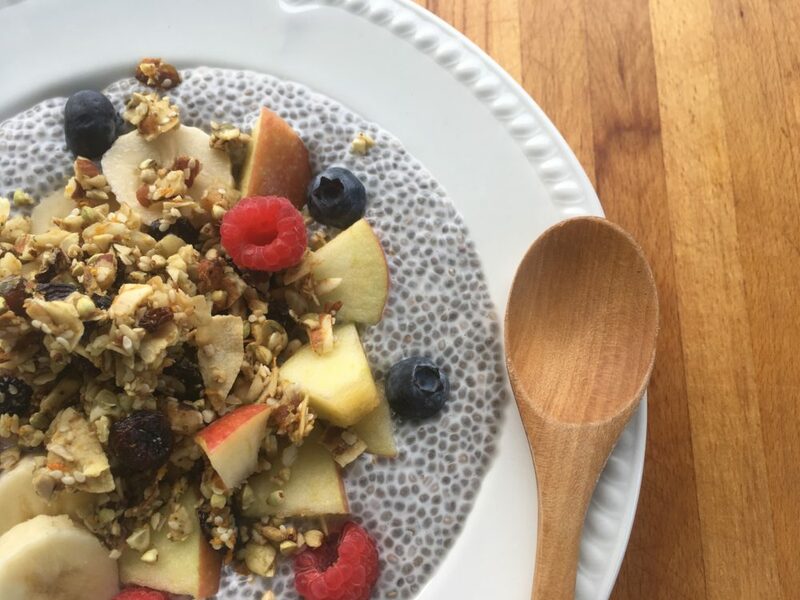 Chia seeds are tiny but really amazing, as they are also high in fibre and contain a host of other important nutrients too, such as iron, calcium, magnesium and zinc! Have a raw snack – cut up some celery sticks or apple chunks and dip them in raw nut butter. It really is as easy as that! Make your own nut butter, or simply buy a jar of ready-made…just look out for organic brands (such as Carley’s or Raw Health) that are made from 100% raw nuts so that you avoid any unnecessary additional ingredients such as sugar or oil. So I hope you go ahead into 2018 feeling really encouraged. I’d love to hear how you get on, just click here to get in touch. Here’s to a raw-ing 2018!